Friday’s home opener for the Wood River High School varsity football team against the unbeaten Gooding Senators turned into a struggle from many standpoints for coach Kevin Stilling’s Wolverines. Wood River entered the game without the services of its leading tackler, senior Drew Barsch (back injury), and its senior center Buck Horn. Many young, untested players were summoned into the non-conference game. And both teams had to deal with an officiating crew that used its whistles liberally, calling 18 penalties for a total 167 yards. But the main obstacle for Wood River (1-1) was a determined group of gang-tackling Senators coached by Cameron Andersen who came to Hailey with one purpose—to win a football game. And they did, by a 13-0 score with only one touchdown and two field goals. Gooding (4-0) posted its second shutout and has now outscored opponents 156-26. It was a defensive struggle chocked full of punts (13 between the two teams) and whistles. Gooding’s offense had the ball for nearly 29 minutes, running 78 plays to Wood River’s 48, and out-rushed the home team 172-64 in hard-won turf. The Wolverines were shutout for the first time in 18 games dating back to Sept. 2010. Hailey’s offense didn’t have bad field position, but 0-for-12 production on third and fourth downs plus ill-timed turnovers turned back opportunities to put the ball into the end zone. Still, despite the personnel changes, coach Stilling was proud of his defense that logged plenty of time on the field and held Gooding’s powerful running attack to 3.2 yards per carry. Twenty-two times, the defense stopped the Senators for two yards or less, 10 of those times for negative yardage. Leading the Wood River tacklers were sophomore Hayden Thayer and junior Cody Richmond with 12 tackles apiece, and KJ Savaria with 11. 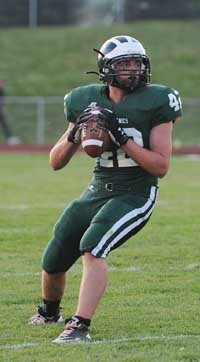 Thayer and sophomore Zac Swanson recovered fumbles. Senior Trevor Brand punted four times in the second half including a 55-yarder. Gooding’s only touchdown, by junior Torin Brunson, came on a seven-minute, 15-play, 600-yard drive late in the second quarter. Keeping the drive alive was a late-hit penalty whistled on the Wolverines during a seven-yard quarterback sack that would have forced Gooding into 3rd-and-18. Gooding’s 6-0, 200-pound sophomore Josh Finley (157 all-purpose yards) starred, rushing for a game-high 102 yards. In other games: Jerome (2-2, 1-0) equaled its win total of all last season 35-2 at Canyon Ridge (0-3, 0-1); Great Basin Conference defending champion Minico (2-1, 1-0) held off an upset bid by visiting Burley (2-1, 0-1) by a score of 26-20; and Twin Falls (1-2, 0-0) trounced Nampa 38-15 on its homefield. Wood River returns to Hailey’s Phil Homer Field Friday, Sept. 21 at 7 p.m. for its Homecoming football game against the Kimberly Bulldogs (0-3). It’s the first meeting of the two schools since 2008. Kimberly (19-10 the last 3 years, a State 3A quarterfinalist in 2011) has been outscored 91-29 in dropping its games at Valley 22-16, home against Declo 42-0 and home against American Falls 27-13. In the 28-game grid series between the schools, Kimberly leads 16-12 including a 33-10 victory at Hailey’s Homecoming the last time the two teams clashed four years ago. Wood River last beat Kimberly 28-7 at the 2006 Hailey Homecoming. Autumn officially arrives in the Wood River Valley Saturday, Sept. 22. And with it comes the end of 2012 Homecoming Week at Wood River High. School events at Wood River began Tuesday, Sept. 18 and continue through the football game against the Kimberly Bulldogs Friday, Sept. 21 starting at 7 p.m. at Hailey’s Phil Homer Field. - Wednesday, Sept. 19: Dress-up day is “Red Carpet Day,” along with school pictures. There is a catwalk during lunch with prize giveaway. Girls’ volleyball match against Twin Falls begins at 6 p.m.
- Thursday, Sept. 20: Dress-up day is “White out!” Boys’ soccer at home against the Jerome Tigers with the varsity game at 4:30 p.m. followed by the JV. Tonight’s bonfire has been canceled because of the valley’s current smoke situation. - Friday, Sept. 21: Dress-up day is “Show your School Spirit!” Early release 1:40 p.m. Homecoming Parade 2:30 p.m. down Main St. Football game 7 p.m. against Kimberly including announcement of the royalty. Homecoming Dance 9:30-11:30 p.m. for students with ID. - Saturday, Sept. 22: Boys’ soccer at home against Madison of Rexburg, “Senior Night” for the Wolverines, starting at 11 a.m. for the varsity. Senior girls (Queen): Taylor Bernston, Nicole Pratt, Sydney Tidwell, Maggie Williams and Mateja Heinrich. Senior boys (King): Jack Watters, Tim Boyle, Trevor Brand, Ryan Roemer and Nathan Lago. Junior girls: Haley Montgomery, Chloe Davis, Sage Rust, Sarah Arters and Chloe Lichtenberg. Junior boys: Quinn Guthrie, Drew Morse, Cooper Bailey, Andrew Graves and Matt Reidy. Sophomore girls: Sammy Sutton, Brittney Bradley, Brigette Thomas and Claire Sauerbrey. Sophomore boys: Hayden Thayer, Zac Swanson, Kole Mauldin and Sage Kelly. Freshman girls: Maggie Marcouiller, Courtney Hall, Carol Hoffman and Grace Kotara. Freshman boys: Jordan Bjorkman, Brady Delgadillo, Alec Nordsieck and Danny Graves. Boost Wood River High School school spirit for Friday’s Homecoming football game against Kimberly’s Bulldogs by wearing the green and attending the pre-game Homecoming Tailgate Barbecue. Senior parents are organizing the barbecue as the major fundraiser for the 2013 Senior Bash that is part of graduation. Alumni and all community members are welcome. Friday’s tailgate barbecue is served from 5-6:30 p.m. in the parking lot adjacent to Hailey’s Phil Homer Stadium. Besides the barbecue items, fabulous desserts will be offered. Rushing—KJ Savaria 13-38; Gus Conrad 2-21, 1 1st; Tommy Bailey 4-10, 1 1st; Hayden Thayer 2, -2; Ian Keys 5, -3. Passing—Tommy Bailey 2-10, 40 yards, 2 1sts, 1 interception; KJ Savaria 0-1. Receiving—Hayden Thayer 1-23, 1 1st; Cooper Bailey 1-17, 1 1st. Fumble recoveries (2)—Zac Swanson 1, Hayden Thayer 1. Sacks (2)—Nick Schell 1-8; Champe Kotara and Kole Mauldin 1-4. Tackles (89)—Hayden Thayer 12, Cody Richmond 12, KJ Savaria 11, Jared Anderson 7, Nick Schell 6. Champe Kotara 6, Gus Conrad 6, Karel Kaiser 4, Wyatt Griffith 4, Jon Reigle 4, Chris Carnes 4, Jackson Toothman 3, Cooper Bailey 3, Zac Swanson 2, Kole Mauldin 2, Taylor Douthit 1, Quinn Guthrie 1, Joe McGonigal 1. Rushing leaders—Josh Finley 14-102, 6 1sts; Torin Brunson 22-47, 2 1sts, 1 TD; Josh Faulkner 13-16, 1 1st; Kyle Rison 3-6; Kaden Barrus 2-0. Passing—Josh Faulkner 6-10, 51 yards, 2 1sts. Receiving—Kevin Arkoosh 3-29, 2 1sts; Kyle Rison 1-9; Josh Finley 1-7; Tyler Magnelli 1-6. Fumble recoveries (1)—Tyler Magnelli 1. Interceptions (1)—Kevin Arkoosh 1 with a 15-yard return. Tackles (42)—Sam Dalton 6, Wil Balch 5, Travis Rison 4, Cole McGinnis 4, Hank Boeger 4, Tyler McCoy 3, Kevin Arkoosh 3, Landunn Koyle 4, Eric Finley 4, Kaden Barrus 2, Tim Inglin 1, Josh Finley 1, Tyler Magnelli 1.